There’s a reason why my eBook and camera club talks on astrophotography are called ‘Don’t be afraid of the dark.’ It’s intended as partly metaphorical; for some, using their camera in low light settings can be well out of their comfort zone and something that fills them with a degree of trepidation. But it’s also partly intended in its literal sense. To photograph stars, you have to go to some very dark places. Places where you can barely see or make out what’s around you. And places where the darkness sends the mind and imagination off in all sorts of scary directions at times. But the truth remains: the darker the better, when it comes to stars. For it turns out that the night sky is never really quite fully dark. On clear nights, of course, there is the star light itself, twinkling down gently on us. 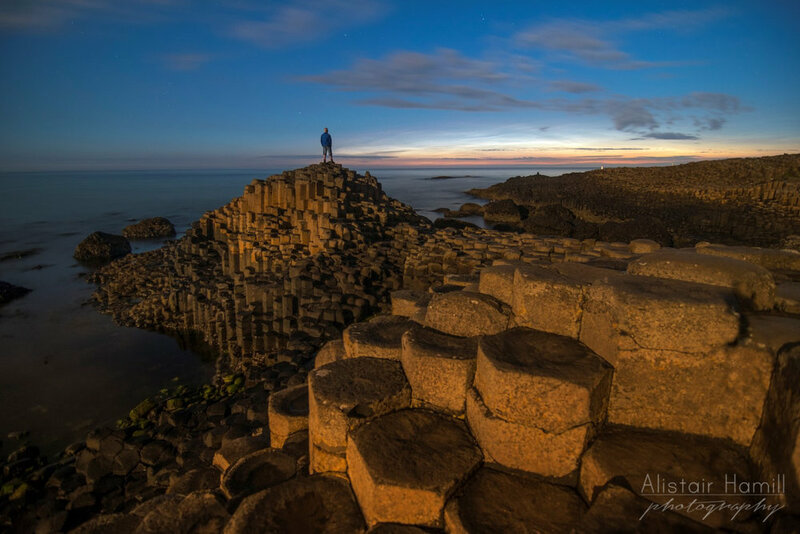 And I have been out on occasions where the starlight alone was so clear and so bright that I was able to pick my way over the uneven columns of the Giant’s Causeway without the need for a torch. But there is something other than that, shining at night, meaning that the very dark skies themselves shimmer with light, albeit very faintly. And I had my most recent experience with this just a couple of weeks back during my last astrophotography workshop. The workshop folks, enjoying sunset before the serious astro business began. After capturing sunset along the sublime Causeway cliffs, we had just finished photographing the Milky Way to the south west, rising up like a majestic celestial swathe of soft light above the cliffs behind the Causeway. I said to the guys that I would point my camera north and see if the aurora that was possible that evening was in fact there. And indeed it was, albeit a faint one. But, when I took my couple of test shots, something odd seemed to be happening. It appeared like my white balance was all thrown off. There was a strange green hue across my whole shot, something bigger and more extensive than the aurora itself. At first, I thought it was a fault with the camera, and I tweaked my settings to try to see if I could resolve it. But, try as I might, the ‘fault’ remained. And it was only then that the realisation dawned on me - this was a phenomenon called airglow, the feature that is responsible for the night sky never being fully dark. I had first photographed airglow earlier this year, on one particularly cold night at the Causeway (where else?!). Airglow over the Causeway from January 2017 - and there's the Milky Way to the north, with the pinks of the North America nebula shining through right at its heart. Airglow earlier that same January evening, this time behind the unmistakable outline of Dunluce Castle. But this was airglow like I had never seen it before. It was extending far up into the night sky and was so intense that it cast such a strong green hue across my whole shot. So strong, in fact, that the entire ocean itself was glowing green on my photos, reflecting back some of the light that was cascading down from above. Indeed, even the puddles of water in the hollows of some of the columns from the day’s earlier rain glowed green. This was truly a beautiful sight, and it was amazing to witness it during the workshop. The green hues of structure filled airglow reaches high into the sky, whilst the subtle aurora along the horizon throws up some faint pillars, as if to say, "Don't foget about me!" Airglow happens when the molecules high up in our atmosphere (more than 80km high) emit photons of light. During the day, these molecules are ‘excited’ by energy from sunlight and, in their excited state, the atmospheric molecules such as O₂ break apart into oxygen atoms. They store the energy they picked up for a few hours, then the atoms recombine into molecules once again and the excess energy is given off as light (in the case of oxygen, this light is green). Airglow happens during the day, but the sunlight from the sun makes it impossible for us to see it. And it carries on into the night; however, on the vast majority of nights, you’ll not really notice airglow, even in long exposure photos - in large part due to the fact that night airglow is only about one thousandth the level of the daytime emission. However, every once in awhile, the emissions of light from night time airglow become more pronounced. And, if you happen to be out photographing under conditions like that, your long exposures on your camera will pick up a strange glowing wash of (most commonly) green across the sky. It turns out that, in the past, there have been times when airglow was very visible even to the naked eye, and so bright that people have been able to see far off mountains or even read a newspaper. In fact, Pliny the Elder reported that “the phenomenon commonly called 'nocturnal sun', i.e. a light emanating from the sky during the night, has been seen during the consulate of C. Caecilius and Cn. Papirius, and many other times, giving an appearance of day during the night.” More recently, such bright airglow nights have not really been reported so much. But what might explain the variation in airglow? Why is it brighter some nights than others? A recent study for the Geophysical Research Letters in the USA has suggested a mechanism that might explain these variations. Scientists have found a link between large waves in the upper atmosphere, produced by weather events lower down. When the peaks of some of these waves converge, they can produce more intense localised airglow that might persist for a few nights in a particular location (they estimate that more intense airglow can occur on about 7% of nights at some localised places somewhere on Earth). Not only was the light from the airglow bright enough to light the sky and the ocean, but it rippled with structure, courtesy of some gravity waves sweeping up from below. And here we were, standing on the ancient stones of the Causeway, staring up at this wonderful sight rippling through the sky above us. But that was not all that was going on. For on closer inspection, it looked like there were thin wispy clouds trailing across the sky. At least the photos suggested that. In reality, the skies were crystal clear and there wasn’t a sign of a cloud to the naked eye. So what was the camera picking up? It appears that sometimes the airglow is not always a homogenous glow of light, but that it can sometimes have structure and features in it. What looked like clouds, were actually waves in the very light that was shining in the darkness. And, my goodness, were they beautiful. Ripples in the sky, shining down on the ripples of the ocean below. It appears that these ripple structures are also produced by waves, known as gravity waves. The most common example of gravity waves are the waves formed on the sea by the wind. They form when the fluid is disturbed from a position of equilibrium. The wave initially moves in one direction, and gravity acts to pull it back towards its starting position - but it ‘overshoots’ and begins the wave-like undulations we see on the ocean. Such gravity waves can also form in the atmosphere. For example, when air is displaced upwards over a mountain, the column of air above the mountain is displaced upwards, knocking the air out of its equilibrium state and producing the oscillating gravity waves. As these waves move up into the upper atmosphere, up to where the airglow is occurring, it can cause oscillations there which produce wave-like structures in the airglow. And that’s exactly what we were seeing. Dimples, undulations, ripples - all sort of glorious structure in the night sky above us. Gloriously beautiful to behold. Gravity waves are responsible for other wonderful atmospheric patterns. The delightful noctilucent clouds - those ephemeral night glowing clouds of mid summer - are famous for their beautiful striations and herringbone patterns. The patterns too are the result of the undulations of gravity waves, propagating upwards from the lower atmosphere. Gravity waves causing the distinctive ripples of the noctilucent clouds above Carrick Castle. A subtle noctilucent cloud show at the Causeway, still with those tell tale gravity wave patterns. A time lapse of a noctilucent display in 2015 - followed by the most stunning of mid-summer aurora shows, thrown in at no extra cost! But you don’t need to go to the highest reaches of the atmosphere to see them in action. Lower down, in the troposphere, when you get a band of cloud with another band of air above it moving at different speeds, the upper band can disturb the lower band, settling up the wave undulations known as Kelvin-Helmholtz clouds, themselves a beautiful sight to behold. So, next time you’re out shooting the stars above us, if you seem to find that your white balance is off, don’t immediately assume that there’s a fault with your camera. Look carefully once more, and you too may be witnessing yet another one of our atmosphere’s night light displays. Sure, there’s hardly even enough dark to be afraid of in nights like that!